If you send your clients the same invoice every month/day/week/year (for example, they have a telephone subscription/rental agreement/license subject to charge), you can automate a great deal of the effort involved by setting up recurring orders. 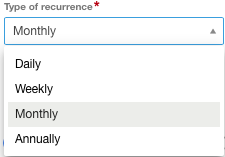 To define the settings of the recurring order, first create an order with the desired positions. If you use article positions, please make sure that the positions are entered as "Services" and not as "Goods". Then click on the menu item "Repetition" in the order. The type of repetition allows you to choose between four types: "Daily", "Weekly", "Monthly" and "Yearly". The selection options under "Repeat on" change depending on the type of repetition chosen. In the case of weekly repetitions, for example, you have the option of defining the day or days of the week you want to set the repetition for. "Starts on" and "Ends on"
Under "Start on" you can define the start date, and under "Ends on" you can enter an end date, where applicable. In the case of orders with an indefinite duration, we recommend the option "Indefinite duration". Once you have saved the settings, the orders with repetition are marked with a green-orange double arrow in the overview list. In the case of orders for which an invoice is due, a yellow warning triangle with an exclamation point is also displayed. 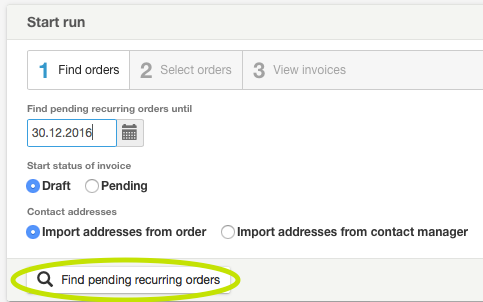 Consult our report "Remove recurring orders (subscriptions)" for information on how to remove recurring orders again. 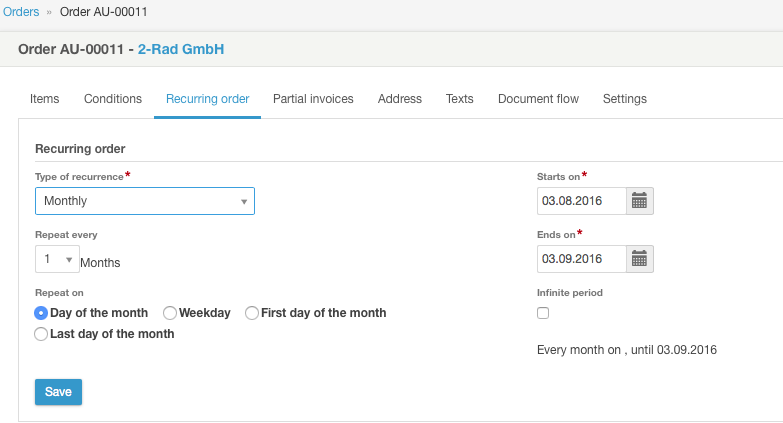 On the other hand, using the assistant "Recurring invoices (subscription)"
When you open a recurring order, you can create the next invoice by clicking on the button "Create invoice for ...". 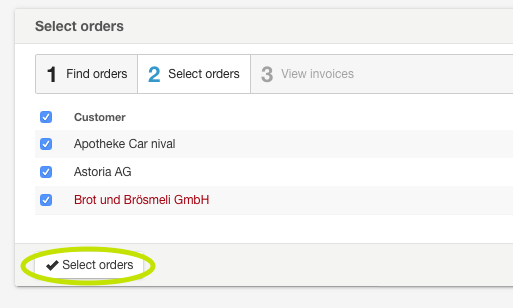 You can find the assistant for recurring orders under: "Sales - Other - Recurring invoices (subscriptions)". Click on "New run" to start a new invoice run. 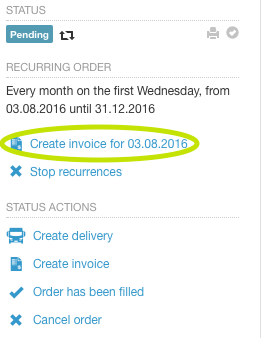 Here you can select the date until when the recurring invoices should be selected. All recurring invoices that were not triggered e.g. on November 20, 2012 are covered by this criterion. Here you can select the status ("Draft", "Pending") that is assigned to the invoices once the invoice run is complete. Select the clients to which the recurring invoices are to be sent. 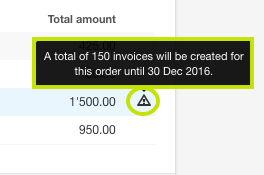 A warning triangle is always displayed on the right-hand side if an above-average number of invoices is generated from a single order. In addition, a conspicuous red font is used. Please pay attention to any warning triangles before creating the orders to prevent invoices from being issued by mistake. Following this, a list is generated containing all recurring invoices that have been created. Click the button "PDF with letterhead" to prepare all invoices with the saved letterhead in a PDF or the button "PDF without letterhead" to prepare all invoices without letterhead in a PDF.